Jodi at Inked Inspirations is offering a Magnolia Summer Kit as blog candy. You might want to take a peek. You have until August 30th to participate. Good Luck! Hi everyone and happy last Friday in August. This bear is so stinkin' cute. LOTV stamps are my current favorites. 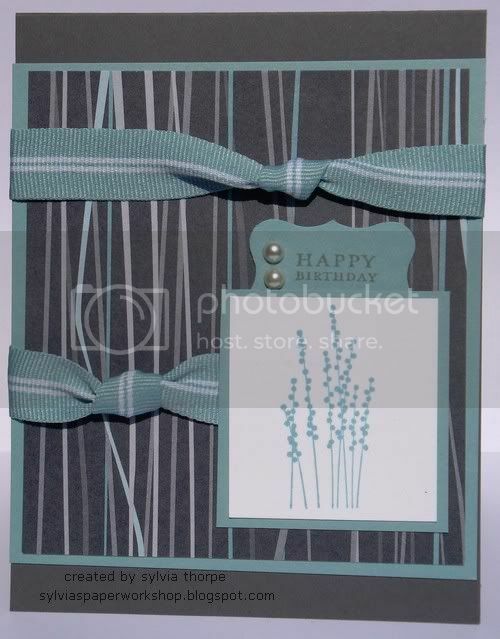 I covered the designer paper with sheer lavender ribbon to tone it down with the rest of the card. 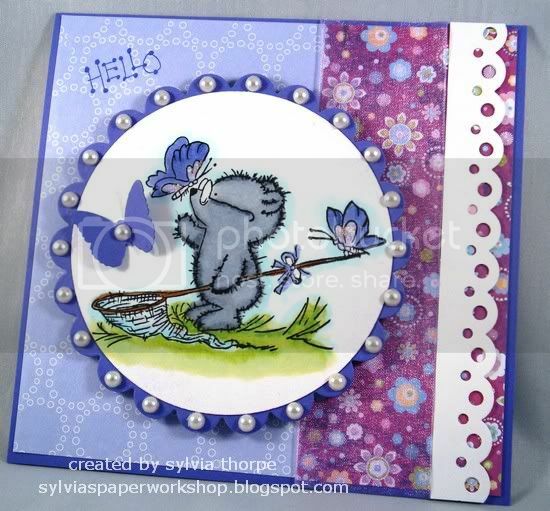 There are stickles on the butterflies to add a little glitz. That's all for now and have a great weekend! A friend asked me to make a 'goodbye, farewell' card for someone in her Wine Club. I only used one stamp. It's a marble texture cube that has rubber on 3 sides for 3 layers. The 1st layer is stamped with the lightest value, then for the 2nd side a mid value is stamped and for the 3rd layer a darkest value is used. What I like about this stamp is that it's very free form and no alignment is necessary. I just stamped randomly. 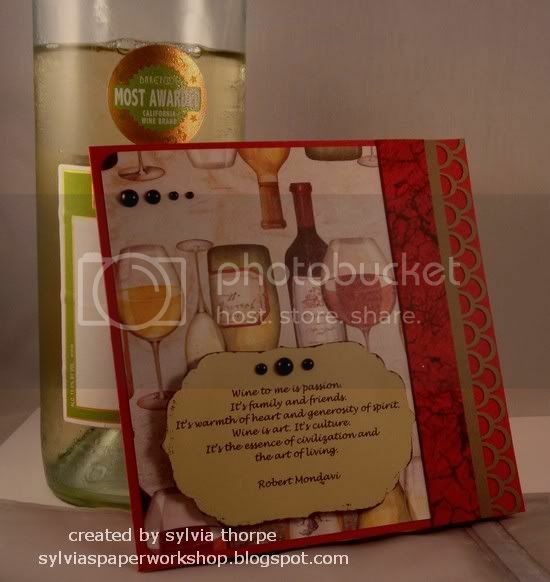 I used a gossamer decorative bag that wine often comes when given as a gift for the envelope. The card is standing on the bag in the photo. I was really excited when I found this bag in my stash. I think it adds that special something. Claire at Crafty C's Crafting Library has some lovely blog candy up for grabs. It's her way to say thanks for supporting her blog. Go check it out. I've got my fingers crossed. Have a great day! 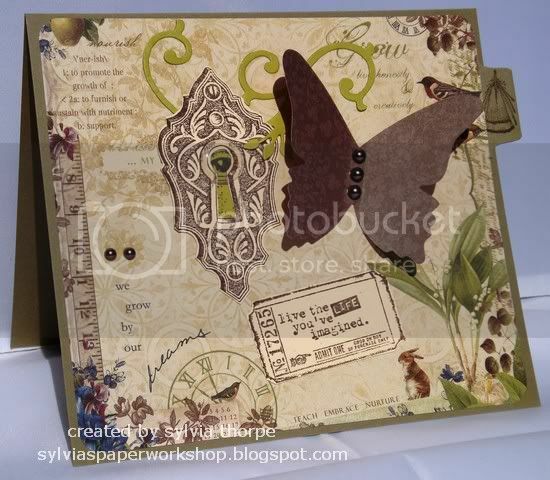 Of the Stampin' Up sets I own, 'Pocket Silhouettes' is one that I use often. It's so versatile and I seem to keep reaching for it. Baja Breeze is probably my favorite SU color along with Kiwi Kiss. Oh, I almost forget to tell you that I'm very excited because I just found out that I will be attending the Minneapolis Copic Certification Class in September. Anyone else going? The humidity has let-up the past few days here in Minnesota. Yes! It's 80's during the daytime and 60's at night, just the way I like it. I'm not ready for snow but this snowman is so jolly. I don't know why the little dots of Stickles look gold in the photo but they're actually glittery white. Have a great day. Our life is frittered away by detail...simplify, written by Ralph Waldo Emerson. I try to live my day-to-day life following these words. 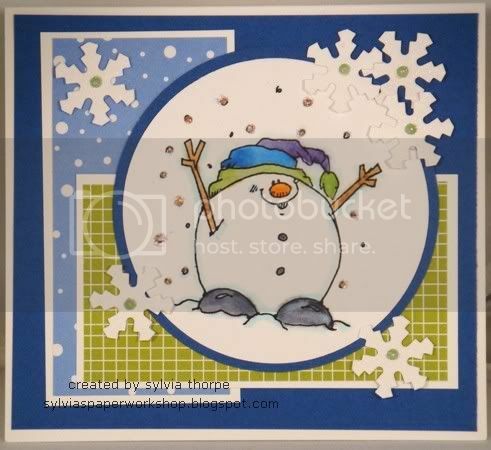 Achieving this goal in my papercraft adventures is a reminder that I NEED TO WAKE UP AND START STAMPING! Yikes, I don't know where this journey of joining the blogosphere will take me. My hope is that I will no longer be a stamp, paper and embellishment collector. My 'stash' will inspire me to create and have fun. If my family and friends are the only ones to read my blog, that's OK...but I hope you will drop-in to visit. My geisha gave me a workout in coloring her black hair with copic markers. I have seen people blend with different gray colors but when I tried that it became a big blobby mess. What gave me the best results was using a feathering technique with 100 black and blend with W4. 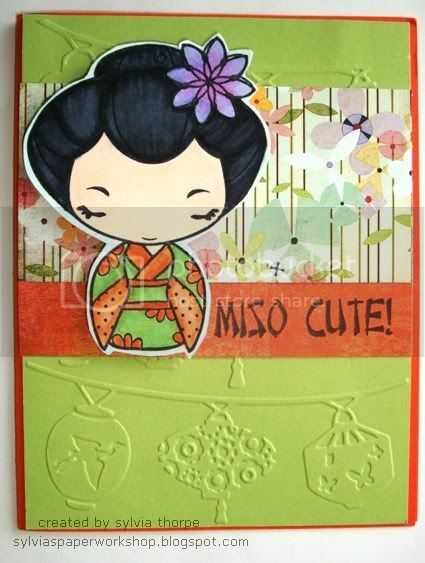 I used this wonderful video at Lysa's Crafty Creations which showed how to feather blend with Copics. A light touch with the marker seems important. I have been stamping for 20 years with some down times over the years. 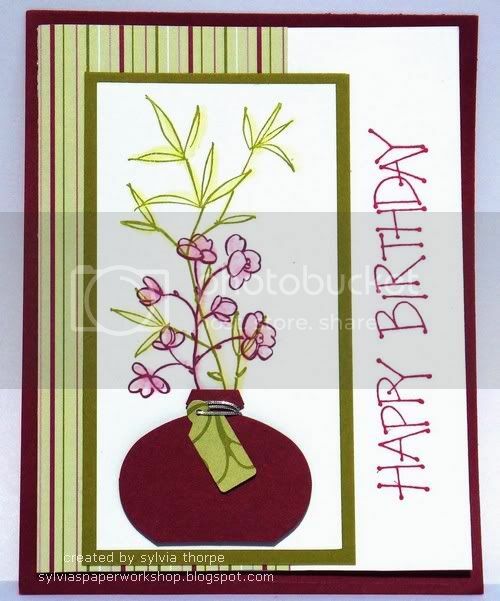 I love cardmaking and spending time at the lake. I'm a wife with two grown daughters. No grandchildren yet. The photo is of our adorable, at least we think so, Rat Terrier, 'Trixie'.